Former Utah Gov. Jon Huntsman before formally announcing his presidential campaign in Jersey City, New Jersey on Tuesday. 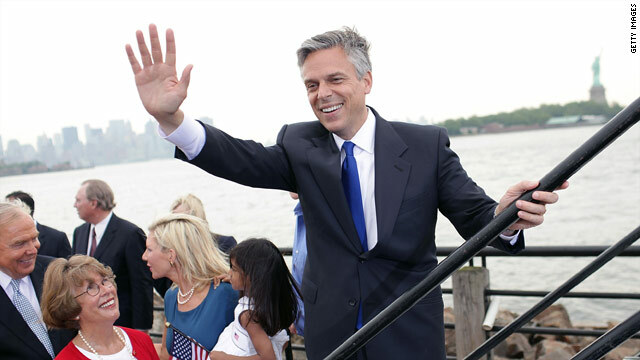 How key is Jon Huntsman’s Mormonism to understanding him and his rise as a politician? His grandfather was an apostle in the Mormon church, his father is a lay leader in the church, and Huntsman himself was a Mormon missionary to Taiwan, which gave him the language skills that helped land his last job, as President Barack Obama’s ambassador to China. On the other hand, Huntsman - who officially launched his presidential campaign Tuesday - has publicly distanced himself from his Mormon faith. It’s not the only move that serious Mormons would consider slightly unorthodox. Salt Lake Tribune Washington correspondent Thomas Burr notes that one of Huntsman’s daughters was married in an Episcopal church. It’s a contrast to the way the other Mormon candidate in the race for the Republican presidential nomination, former Massachusetts Gov. Mitt Romney, has talked about his religious faith. "Romney has not been shy about his love for his faith and gave a big speech in his 2008 campaign about it,” Burr said. “Those who know Huntsman and Romney would say that Romney is very active in his church, while Huntsman hasn't been as active." A spokesman for the Church of Jesus Christ of Latter-day Saints, the official name of the Mormon church, would not comment on Huntsman's or Romney’s level of involvement in the church. “We leave comment on the role of faith in an individual’s life to the individual,” said Michael Purdy, a church spokesman. But the differences between Huntsman's and Romney’s orientations toward their religion may have as much to do with generational differences as with levels of religious observance. Matthew Bowman, an editor at a Mormon studies journal called Dialogue, says Romney appears to embody the Mormon retrenchment of the 1960s and 1970s, when the LDS church defined itself largely in opposition to the broader American culture, which was seeing cultural upheaval and the sexual revolution. Romney, 64, came of age during that era, which Bowman says explains why he appears defensive about his faith, seeming to see it as something that sets him apart. It’s hard to imagine Huntsman, 51, making such a dramatic vow. Bowman argues that that’s largely because Huntsman – who was born in 1960, 13 years after Romney – is part of a subsequent generation of Mormons who see themselves as quintessential Americans, not so different from their non-Mormon friends and neighbors. That new attitude is evident in the LDS church’s current “I’m a Mormon” ad campaign, which emphasizes that there are Mormons of all ethnicities and from all walks of life. “Huntsman is a Mormon who thinks of his faith not as something that separates him from American culture or as something he has to defend or explain away, which is what Romney did,” Bowman said. That’s not to say Huntsman is unobservant. The Salt Lake Tribune reports that the newly minted presidential candidate occasionally attended LDS services both as governor and as ambassador. A survey released this month by the Pew Research Center found that a quarter of American adults admit to being less likely to vote for a Mormon candidate for president. The survey found that resistance to Mormon candidates was even higher among two groups: liberal Democrats and evangelicals, who overwhelmingly vote Republican. One in three white evangelicals said they were less likely to support a Mormon candidate. Evangelicals form huge part of the GOP electorate in early primary states like Iowa and South Carolina. If some GOP voters are more likely to vote for Huntsman because he seems less overtly Mormon, others may be less apt to because of his reputation as a moderate. For instance, Huntsman signed a law that introduced civil unions for gay couples when he was governor of Utah, putting him at odds with his church, which strenuously opposes gay unions. « Previous entryIs America ready for a Mormon president? JJohnsen,I imagine the reosan many showed up was because they were Republicans but that doesn't really explain to me why they don't sit down, sober up and use their brains. It seems that if you congregate a lot of people in a stadium seating atmosphere and they are listening to a celebrity, they can't help but start screaming, shouting and applauding. I've seen this at popular music concerts as well. You'd think people went to listen to music but instead they just want to make a lot of noise themselves.Boy am I a boring old dud. I know, I know. I was studying some of your content on this internet site and I conceive this website is real instructive! Retain putting up. Howdy very nice website!! Man .. Excellent .. Superb .. I'll bookmark your site and take the feeds additionally?I'm satisfied to search out numerous helpful information here in the post, we need develop extra strategies in this regard, thanks for sharing. . . . . . It's actually pretty simple for those of us who are active Latter-day Saints: Romney is a traditional, faithful member. Huntsman is not. I'm also 25 years old. I totally disagree with the characterization of the differences between Romney's and Huntsman's explanations of their faith as a result of generational differences. Cultural Mormonism of the brand Huntsman appears to endorse is just a nice phrase for someone who is not devoted. It has much more to do with personal testimony, obedience, and commitment than it does with what year you were born. Latter-day Saints DO come from all over the world and from all walks of life, but those who are considered faithful typically adhere to a certain set of principles and practices. I think Romney's approach is far more representative of how the LDS church wants its members to be than is Huntsman's. I understand that the Mormons believe the Garden of Eden is in Missouri. Can anyone confirm this? Joseph Smith did say the Garden of Eden was in Missouri near a place I think called Adam Ondi Adam. He did not go into details as to how this could be scientifically true. Joseph Smith is very interesting. There is evidence for and against his claims. There is not evidence to back up the Garden of Eden claim. It is like the faith that Jews and Christians have that Moses and Abraham actually existed when there is no evidence. You can catch a glimpse on Google Maps. I tried to confirm with MapQuest, but the zip code is a secret. OMG I've said too much! What's the difference between LDS (Latter Day Saint) and LSD (drug)? One you take with a cube of sugar; the other you take with a grain of salt.